1. High technical tool which mainly support BMW Auto diagnose, programming and security maintenance 3 in 1. 2. 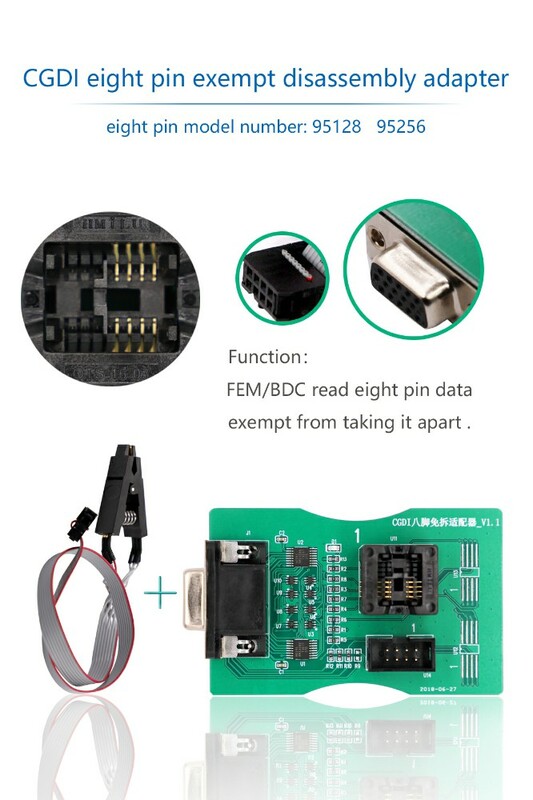 Support Key Programming for BMW CAS1/CAS2/CAS3, Support Key Matching and All key lost for CAS4 /CAS 4+, BMW ISN, FEM/BDC Key Match, BMW Enable/Disable Key, BMW F Series Program, BMW F Series Coding, EGS ISN, CAS Mileage Reset, BMW Data modification and verification. 3. Software response fast, short time programming, and new breakthrough in operation safety and technical support. 7. 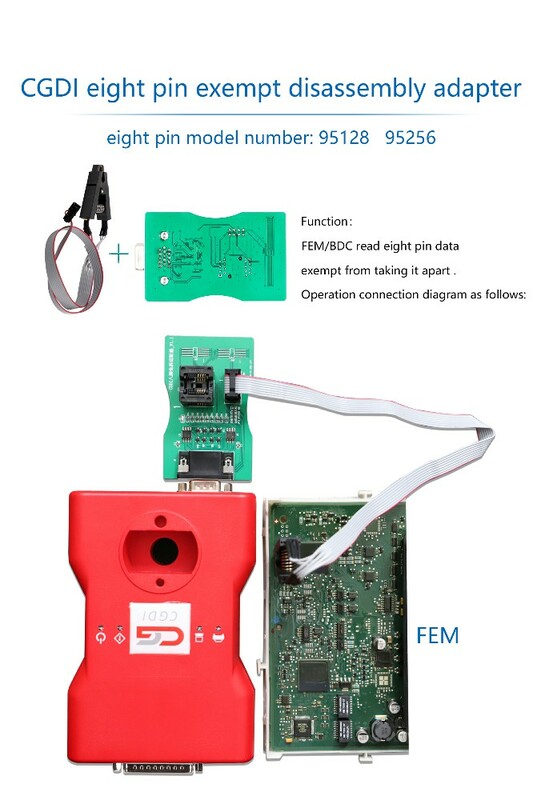 Free Update Online on official website http://www.cgprogcar.com/?langid=en, when you receive the device, please download software on official website too. 8. Newly include Reading 8 Foot Chip Free Clip Adapter in default package, make your job easier! 1. 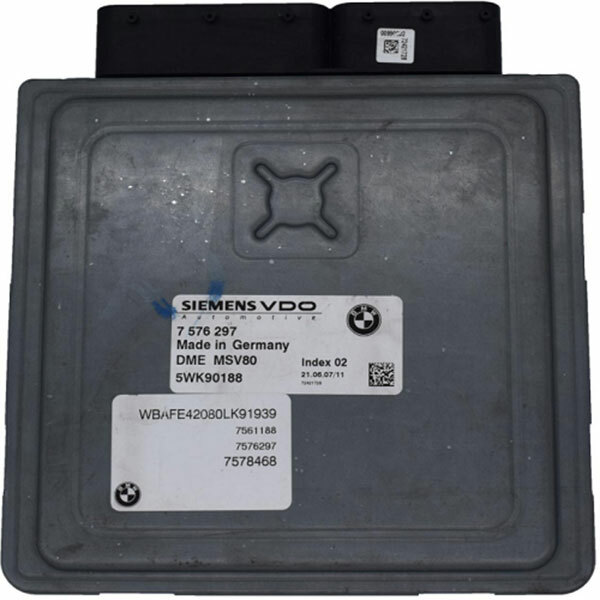 CGDI MSV80 BMW no need activation now, more convenient for customers. 2. 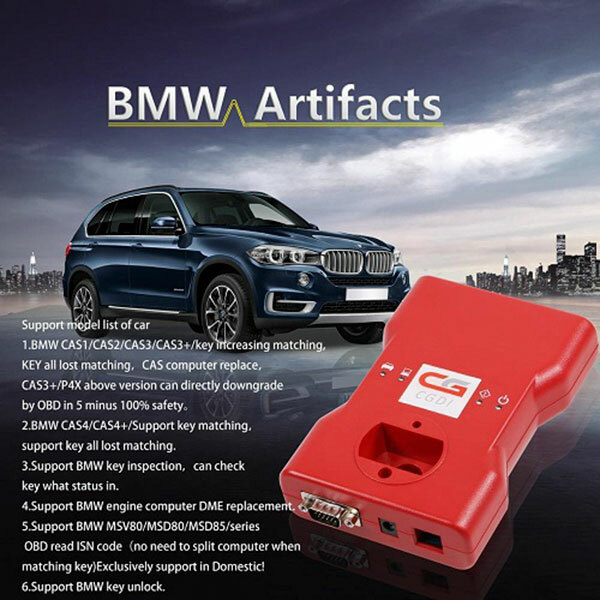 For BMW F Series Coding, EGS ISN Authorization, CAS Mileage Reset, if your have CGDI MB or CG Pro 9S12, you can choose one for free, or needs to pay alone. single module code, backup code and recovery code. files, and fix some programming failures. 5. CAS1-CAS3+ key matching: increase the Rolls-Royce CAS1, CAS2 key matching. 6. BMW data modification: Add CAS3+, CAS4+ ISN encryption and decryption functions. 7. Maserati Mileage Adjustment: Added the function of saving EEPROM data. 8. BMW F-series codding:Fix List display incomplete. 1. Fix some win7 users fail to open the software. 2. Fix a problem that a version has failed to erase the mileage. 5. Increase CAS mileage reset function, support CAS1-CAS3+, a small number of versions of CAS are not supported, if you do not support you can try to upgrade to a supported version. 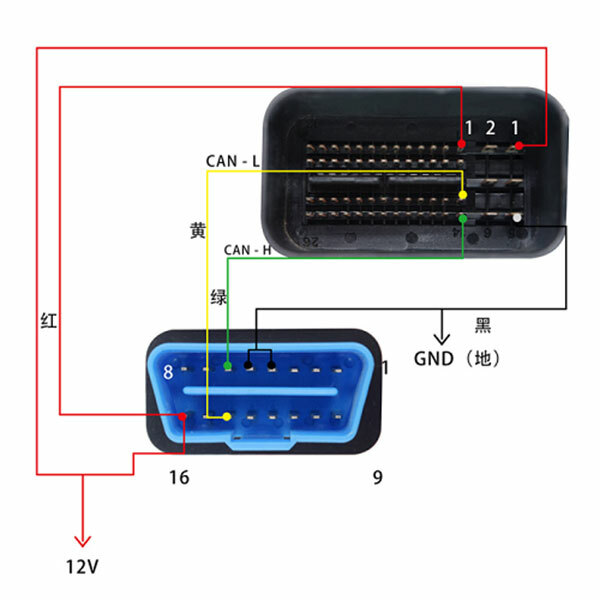 1.BMW OBD key matching: increase "add key" function. Kindy note this update works for customers also have CGDI MB or CG Pro or CG100 Full Version only. CGDI BMW can reprogram EGS for 2009 BMW x5. CGDI Prog BMW supports BMW 650i 2003 all key lost. CGDI BMW can read and write the ISN EWS egs for BMW M5 F10 dct gearbox 2013. Can read from DME and write into egs. for cas3+ if need downgrade 10 minutes and seems safe. and yes it is safe if downgrade for CAS3+. Cas4 can only be done by reading DFlash from Freescale cpu then load into programmer software and generate key. It can no ne done by obd. You need xprog or vvdi prog to read the dflash. Q1: How to authorize CGDI BMW EGS ISN function? A1: The user needs to disassemble and wire the cable. There is no additional cable to work with.